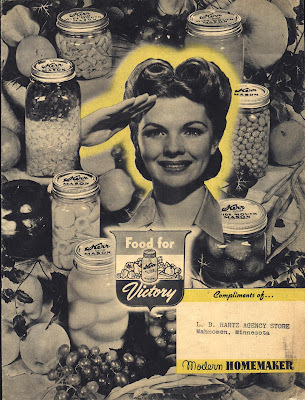 The 1942 "Victory Recipe Edition" of Modern Homemaker (published by American Homemaker, Inc., which, based on the ads and content, could have been a Kerr Glass publication), is a WWII home front "Food For Victory" call for planting a Victory Garden. It is our job NOW to prepare to meet the demand, not tomorrow or the next day, but right now. There is only one time to plant, and if you are not ready at the right time you have lost a year's production forever. There is no way to make it up. No great undertaking was ever won by the half-hearted efforts of a few. 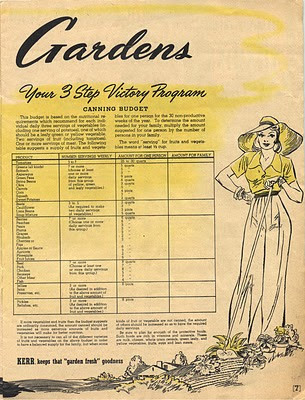 TO WIN THIS WAR it will take the united efforts of every red-blooded American man, woman and child TO PLANT VICTORY GARDENS... TO CAN THE SURPLUS... TO FEED OUR FAMILIES AT HOME AND OUR BOYS AND ALLIES ABROAD. On page 6, information on the "careful study" which should be given to the kinds of fruits and vegetables to be planted. They direct you, whether planting on your own land or in a community garden, to see your County Agricultural Agent (which I suppose today, would be part of or akin to your local university &/or county extension offices) in terms of soil analysis, varieties best suited to your area, etc. 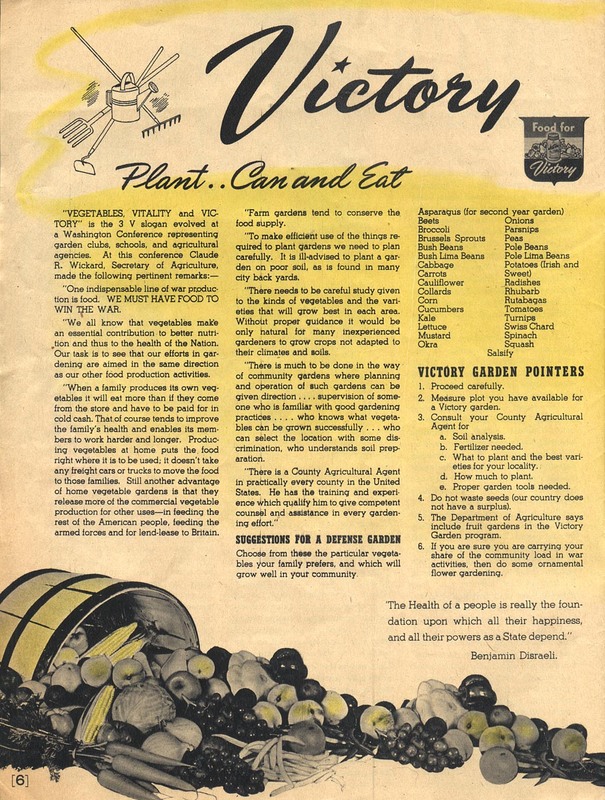 On page 7, "Your 3 Step Victory Program" discusses your canning budget, complete with a chart for calculating how much to can for your family based on the "30 non-productive weeks of the year" (which obviously varies by your local as well). For each vegetable, fruit, meat, jams, etc., the number of weekly servings is translated into an amount for one person, which you then multiply by the number of people in your family to ascertain your canning needs. Now I've never canned food before; most of us have not. Not only the ease of refrigeration, freezing, commercial canning, and commercial freezing, but the low cost, has rendered canning a thing of the past (hence the plethora of cheap glass canning jars at rummage sales, thrift shops, etc.). Aside from the proper supplies for sealing the jars, an increase in water and energy usage, the seeds etc. 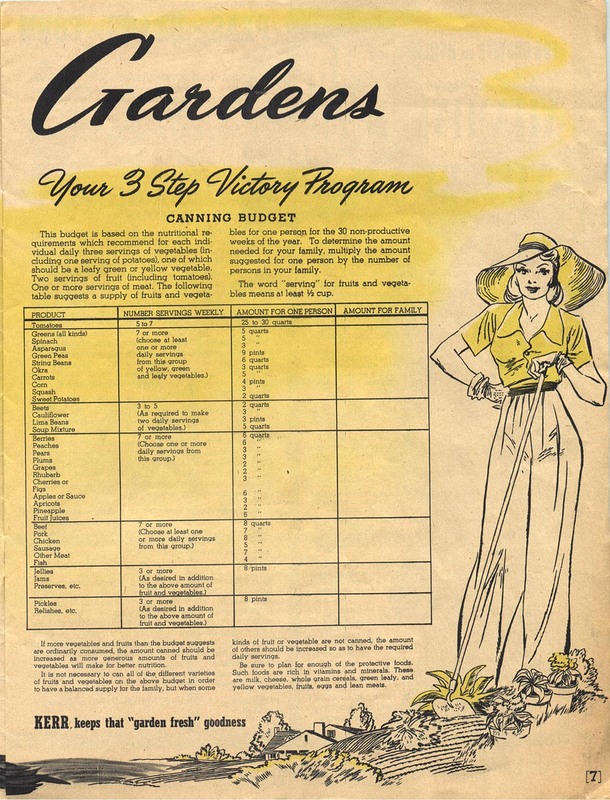 involved in gardening-- and the time spent in labor -- I'm not sure what else is involved... So I cannot speak for the costs (or ease) of canning. And I'm not even sure if canned food is better than commercially frozen, etc. But when you figure in the environmental costs (as mentioned above) of buying groceries from the store and the positive benefits of you and your family working together side-by-side, both in the garden and the kitchen, the equation becomes a matter not simply of the amount of money spent today, but of the potential costs of tomorrow. 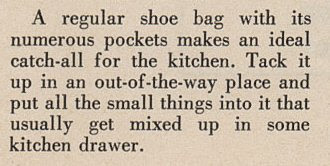 Convert a shoe bag into a catch-all for the kitchen -- or any room, really.